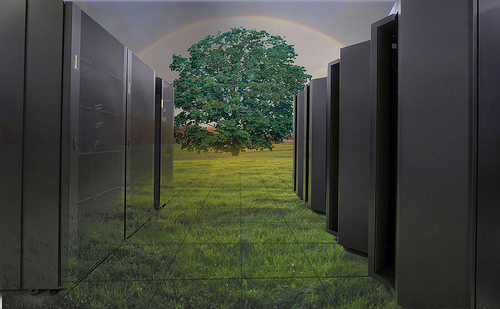 One of the biggest costs for a big data center is power. In fact, according to Greenpeace, data centers typically require close to 100 megawatts of energy. Put in simpler terms, that’s enough energy to power 80,000 homes. While high-capacity systems are inevitable, there are ways for these businesses to reduce their energy consumption and improve their bottom line. The Internet is energy-intensive. One of the biggest areas where data centers stand to improve their carbon footprint, according to Greenpeace, is where that energy comes from. Some companies are working on just that, branching out to solar power options or using air from the great outdoors to cool data centers. There is still much that can be done. For example, there are still states in which Internet companies largely rely on fossil fuels for energy. The Greenpeace report noted in North Carolina, only 4 percent of the energy powering the state’s data centers comes from renewable resources. When looking at the big picture, data centers account for more than 2 percent of all of the power that is generated in the U.S. Therefore, improvements in data centers can actually have a ripple effect, boosting efforts across the country. How does that 100 megawatts of energy translate into dollars? Think millions. These centers can consume millions of dollars’ worth of energy every year. It makes sense, as there are servers that need to be running around the clock. Therefore, simply powering down every night is not an option for most companies. The fact remains that preserving fossil fuels and utilizing cleaner sources can actually help grow revenue by minimizing expenses. It goes without saying that when you can maximize efficiencies in terms of power, utility bills shrink. The ideal power use effectiveness (called PUE) for a data center is measured at 1.0, which would indicate that all of the power the center is using goes toward processing and storing data with no energy being used to cool any servers. For smaller companies, the ideal PUE is not out of reach. In fact, most start with stellar ratings. What happens is the business starts to grow, increasing the number of computers they need and adding more racks. To keep things cool, they increase air conditioning to accommodate for the additional equipment. They grow again, they cool more intensely. The cycle continues and can easily spiral out of control, especially if no one is keeping tabs on how the power is (or is not) being used efficiently. So what can be done? Experts note that the companies that succeed in reducing expenses are the ones that view power as more than just a cost; it is something that can be controlled. The first step any data center should take is to do an audit of how energy is put to use. Most utility companies can provide this service, and some will even do it for free. The trick is to balance reducing power needs with still maintaining the quality output you need. There are energy-efficiency firms that will partner with companies to piggy-back on top of what a utility company can do. Depending on the result of the audit, big data centers may note that making small changes can produce big results. For example, in 2013, Forbes Magazine reported on one retailer that was consuming $7 million of power annually and wanted to make a change. They brought in experts and made changes to things like the racks they used and determined a smart back-up power supply that would keep them afloat if something happened. Many data centers rely on a traditional method of cooling servers, which involves air conditioning. These units typically run around the clock to ensure equipment does not get over-heated. There is an alternative way to generate cool air inside the center, however, and it is known as evaporative cooling. The process involves installing a rooftop tower that will cool the water that keeps servers at a safe temperature. The aforementioned retailer now only uses air conditioning a very small fraction of the time, reducing the power they needed to cool the center by 93 percent. One of the most compelling aspects of what the retailer did was to put the focus on the equipment itself. Typically, a data center utilizes a universal energy supply. An inefficient system will actually produce wasted heat, which means energy is being used to generate unnecessary warmth that in turn needs more cool air to prevent overheating. The solution? Combine racks to actually shrink the amount of space that is used. The universal power supply is then reduced, thus minimizing the energy that is used and the bill that hits the doorstep every month. Upgrading equipment and software comes with a cost. Depending on the size and scope of the center, that figure could exceed six or seven figures. However, the savings can kick in almost instantly. In the Forbes report, the retailer noticed a return on its energy investment in less than a year, now operating at the energy levels they were using half a decade ago despite having added more than 30 stores. Big data centers will inevitably devote a decent part of their budgets toward power, but the kind of power they use and the cost are flexible. By taking the right steps, companies that make the investment can notice a return on their investment in a short period of time, thus improving their bottom line for years to come.